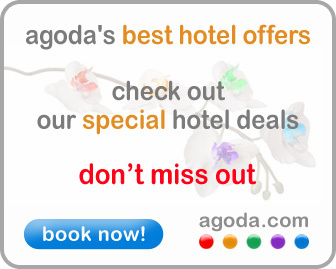 We book nearly all our hotels online via Agoda.com, as we’ve had a really great experience using them. As well as getting the equivalent of 4-7% in points that can be used towards future bookings, they also have a price match guarantee. We only found a lower price once and they refunded the difference right away. We also got a prompt refund one time that a hotel had overbooked. Just click the image below to see how great the hotels and prices are.